3D printing has revolutionized the hobbyist/DIY and developer’s ability to design and create prototypes and parts for all applications. 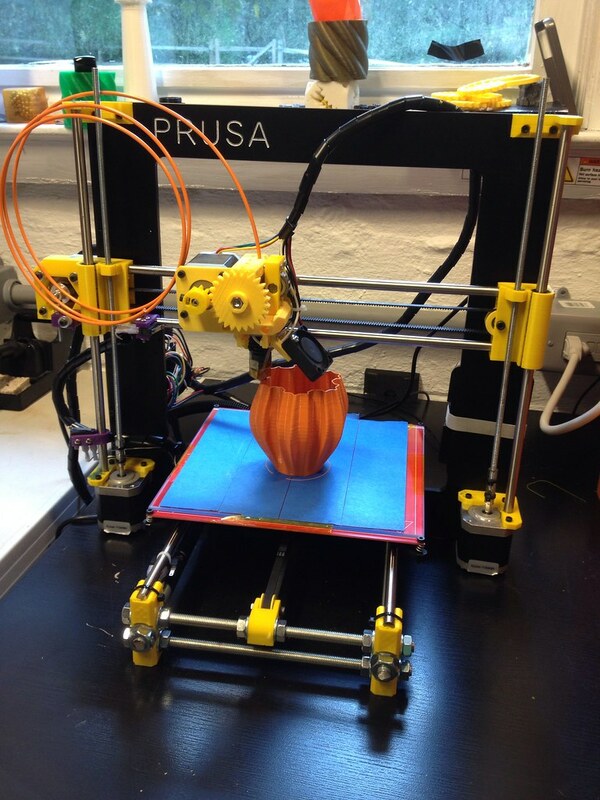 For much of 3D printings history, open source projects have contributed greatly towards the availability of 3D printing, speed, and quality of printers, both commercial and DIY. But as a side effect of this emerging technology being largely community driven, and open source, means that the consistency of documentation and support material is wildly varied. Finding bits and pieces of information you need is possible through scouring hours of YouTube videos and skimming countless online forums, be it very time consuming. This instructable will serve as an attempt to improve people’s experiences and speed up problem solving with 3D printing though documenting mine and others experiences and struggles. Phillips screwdriver #1 - for various screws Small Flat-head screwdriver - for various screws, prying and scraping. Keep these tools at hand, as they are all going to be used. Software is the brains behind the Printer, and is one of the most finincky parts of these designs. 3D Printer software is broken down into "flavors", the flavor that I will be using is one of the most popular for DIY printers becuase of its Open Source nature, Marlin. Marlin came out of the RepRap project for an Opensource 3D Printer design and such has lots of support and help on the internet from other uses of Marlin. Marlin is set up to work with Delta(3 verticle axis's) and Mendle (Pursa) Printers. Becuase each Printer is going to be different there are several places in the software we need to check. First thing first, is getting the Arduino IDE (Integrated Development Engine). The Arduino enviroment is used on 3D printers becuase the microcontroler that runs the printing program is typically ran on an Arduinio 2560 Mega or silimar development board. This is the board that the USB header goes into on the electronics board. You can get the latest Arduino Build from the Windows 10 App Store. Once installed, take open your flavor of Marlin and open the file Marlin.ino with the Arduino IDE. Inside the IDE there will be lots of tabs, the only tab we need to worry about is the configuration.h. Before diving in to the configuration.h we need to make sure the Arduino IDE is communicating with out 3D Printer. Up in the "Tools" menu, look at the entry selected for "Board: Arduino __", and choose your correct model. Then mouse over to "COM port: " and select the USB port that your Printer is plugged into on your computer. Hopefully before coming to this guide you have already wired up the electronics and have deployed code before. But just incase you need some refreshing, ill have the basics for you here. Out of your power supply connect the 5v leads to the Arduino, and the 12v to the RAMPs controller as shown in the diagram. Take the USB header from the port on the Arduino to a USB port on your computer. Depending on your hardware, the level of diffculty will vary for getting power leads stripped and wired to the Power Supply. In marlin the defaults are throughly tested to be the best for the most printers in general sutitiuations. But there are some specifics to double check before flashing firmware that runs all the moving parts. In this look under Mechanical Settings section for INVERT_X/Y/Z_DIR, this controls the directions (left, or right) that your motors move relative too. The defaults for this and most things should be fine, but if you experiecne any werid behaior, I would experiment with switching the boolean's here to acheive the desiered motion. The next section to be arware of is the X/Y/Z_HOME_DIR, this relates to the placement of your axis endstops. In my build, I have my endstops acting as Origin (0,0,0). that is with evey axis its origin point is an endstop, that way I can ensure that the printer is always within its bounds. In the software I set this with the Home direction. For the Z axis, my home direction is -1 becuase the 0 endstop for that axis is at the bottom to help me find bed level. For the Y axis it is also -1, so that the bed retracts out of the way when it is homed. For the X axis it is also -1 becuase I want then endstop sensor wire short and close to the electronics. This guy is the man. He has the best guides and reviews on 3D printers and software. Extreamly knolageable and knows about the issues you are going to run into, If you have any problems or just want to learn everyting about the 3D Printing world, I can't recommend Thomas's channell enough. Your Printer has to be powered, your Power Supply handles dealing out consistant and proper voltage to the other hardware. But how your PowerSupply gets power is important too. My kit had me wire the PSU directly to the wall witha stripped power cable. I thought this was a poor choice and one of the first modifications I did to my Printer was add a power jack and fuse box outside of the PSU. Here you can see a close up of my PSU. On the left is the live and neutral wire (polarity dosent matter here) and the green ground wire 3rd from the left. Power from the wall before getting to the PSU, first has to go through my fuse box / switch. Soldering can come in handy, especially when working with Printers, sometimes a wire isnt long enough or is too short, what ever the case, puting a crimp in or tinning an end, solder can save you. Take the hot end of your Iron to the twisted pair, let it heat for a few seconds. While holding Iron on wires, apply drop size ammount of solder to the wire, if at the proper temperature, the solder should flow into the wire. Heat shrink is my favorite insulator, as it always makes a sung fit. The key to using Heat shrink is to remember to slide it on to the wire you are working on before ever soldiering it. Then once soldered, just slide the tube of shrink up over the new joint, and either use a lighter to cook it slightly or the tip of the Iron constantly moving to shrink the tube. Electrical tape also works here in a pinch. A major upgrade to a printer can be a new Extrude head. The extrude head is a critical part of the Printer. This is nozzle that is responsible for melting the filiment and controlling the amount that is extruded. Starting from a new build or after removing the old (like the photo) Ill hit some high points that most every direct drive extruder has. First thing is to plan out the parts you need to get, now you can make them ahead of time like I did if you hav a functial printer. If this is your first build or you are repairing one, you might have to look at premade solutions. I choose a modifyed opensource design that another use of my Printer style has created. the Tiny Flex Extruder for E3d V6 Hotends. My old extruder had most of the hardware requried to assemble this new design except for the new hotend it self and some 3D printable mounts. The hotend that goes with this is the E3D V6 hotend. Taking the printed 3D parts from the Tiny Flex assembly, I mount them on the motor. using the 3mm screws that my origial Extruder came with. Tension is needed to squeeze the filiment strand aginst the geared shaft that pushes plastic into the hotend. This tension is supplied from a spring arm, some Pliers are recommend for this task, as the spring has lots of resistance to it. After testing the proper tension, the last big peice to attach is the new Hotend it self. Depending on the exturder you chose, your design will be different. Mine here attaches via a screwed clamp that holds the hotend directly under the extrude shaft, greatly simplify the path the plastic has to take. Weaving the hotend wires safely out of way,up and over to the electronics board, along with the extruder motor wires. The last thing to hook up is the Hotend cooling fan. The fan is important becuase you do not want heat traveling up into your plastic parts and softening them. So the safest thing is to put the fan directly into 5/12v power on the PSU, so that there is no worry about it cutting off. After all that its time to boot it up and level the bed. Best of luck and come back later for more guides! Excellent guide. Very well written. Thanks for sharing it with the community.